No person is complete without a nice rack in his or her life. A good rack just make any mess of things look aesthetically pleasing. For those of you with your objectifying heads in the gutter, bring it back fam. I’m talking about organization here, pls. For those of you with way too much stuff or too little stuff, racks are probably the best way to organize! If you have too many things, you can organize them on a rack, allowing the shelving layers to give you more space for your belongings without taking up more floor space. Now on the flip side, racks can help those of you with only a select number of items to evenly display them, giving the illusion that you have all these cool things when you only have a few. You can even play around with placement, artistically creating room decor. Below, you’ll see a few things that I display in my room. For a little perspective, I have over 55 pairs of shoes. Not all would fit in one location unless I was to buy a giant bookcase, but I found that placing my most worn shoes by the door on a space efficient rack has not only been convenient but much more aesthetically pleasing. Now another item I’m guilty of hoarding is nail polish. Most girls store their polishes on a wall shelf, nailpolish rack, or in a bin. For me, I found the most efficient way is on a tiered wooden spice rack on my desk. Not only is it easier to access, it displays my colors and brands nicely. The only downside to tiered racks are the ability to knock things over easily. Nonetheless, it makes a great display and decor piece. Last but not least, my all-time favorite. There’s something about these 3×2 display cases that really get me. For starters, the bins allow me to store some messier items without ruining the aura of the room. Second, it provides both functionality and decor potential. For example, my two bins store art supplies and hair products/heat tools. My other cubby-holes store and display some of my favorite or most used items. This allows me to use this organizational unit to simultaneous store and decorate. Furthermore, the top of the shelving unit also allows me to display other objects, such as perfume. Now I am obsessed with perfume. It’s the reason why I have 14 of them laying around. I found that the best way to display my bottles is to arrange it on a tray and display it somewhere accessible, especially for when I’m in a rush in the mornings. For any of my perfume junkies out there, don’t you worry! I’ll be sharing with you how I find my signature scent soon. 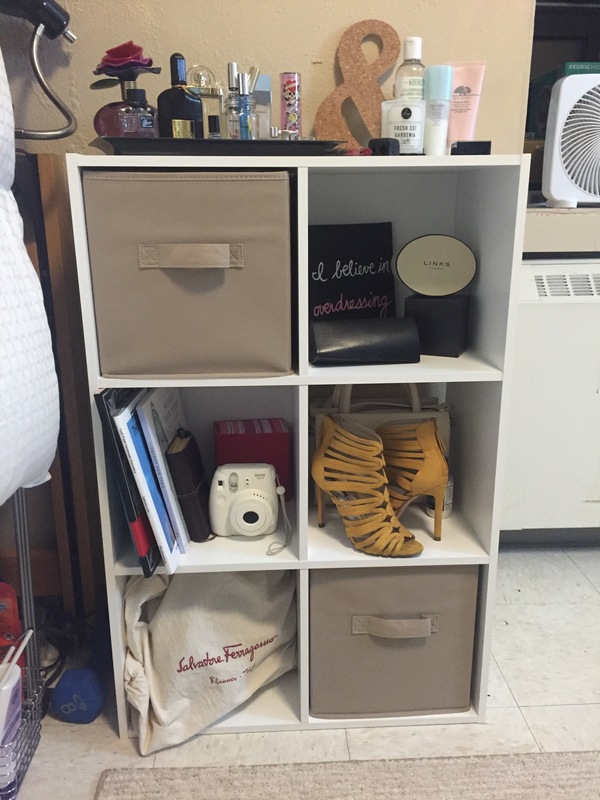 In the meantime, I hope this gives you all a little inspiration on how to organize any clutter you have in your dorm rooms/apartments/homes.